Those with sensitive teeth often have sharp, intense pain when eating or drinking. Foods and beverages that are hot or cold are typical triggers, as are those that are sweet or sour. Additionally, some people may experience pain when breathing in cold air. In addition to seeing a dentist, there are some steps you can take at home to help reduce tooth pain caused by sensitivity. There are special toothpastes designed to reduce teeth sensitivity. Be sure to brush twice a day and floss daily to keep teeth clean. Reduce your use of mouthwash, which may have an acidic effect on the teeth. A fluoride rinse may be beneficial. Vitamins such as thiamine (Vitamin B1) and calcium hydroxyapatite can help reduce sensitivity and strengthen the tooth root to help reduce the amount of pain. Vitamin D and magnesium also help strengthen teeth. Clove oil, cinnamon oil, or mustard oil can also alleviate pain. Rub a few drops along gum line or place on a cotton pad and hold in your mouth against the sensitive area for a few minutes at a time to help reduce pain. Rubbing gums with salt or baking soda can help. In the alternative, you may mix one with water for a rinse. If you have sensitive teeth, it is important to see your dental care provider. 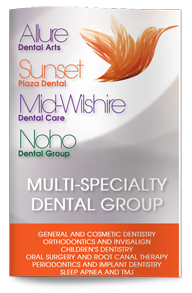 Our dentist in West Hollywood can make proper recommendations based on your needs and provide advice on proper care to reduce sensitivity in your teeth.